Ventrally rather bulbous due to large cell groups and fibres running transversely between large pontine nuclei and the cerebellum. 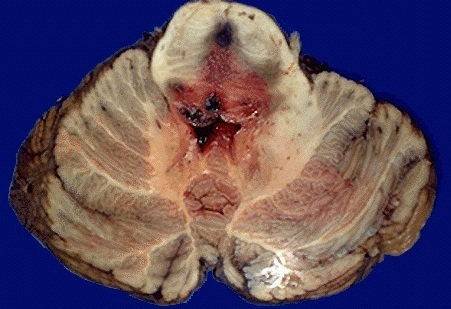 Laterally lies the bulging middle cerebellar peduncle. 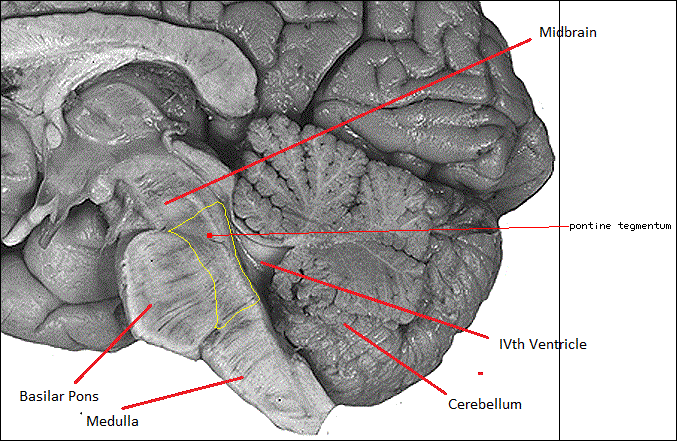 The pontine nuclei mediate fibres coming from cerebral cortex to the cerebellum. The VI, VII, VIII and V nerves all leave ventrally. As its name suggests it is bridge like and like any bridge it is a major crossover centre for fibres carrying signals bidirectionally from above and below and communication with the cerebellum. Like any bridge it covers the CSF filled 4th ventricle which separates it from the cerebellum with its vermis and hemispheres which sit tightly behind. Pontine strokes are usually due to occlusion of leg from small perforating arteries or to obstruction at the basilar level of the ostia or even total basilar artery occlusion. It is seen in those with hypertension and diabetes and in an older age group. Occasionaly there may be an underlying vascular anomaly. Ischaemic strokes appear to respect the midline. 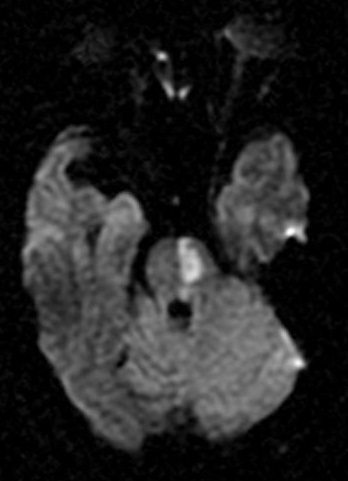 The fact that the fourth ventricle lies behind the pns means that any swelling here or bleeding into the ventricle can result in obstructive hydrocephalus which may require shunting. Strokes can damage the corticospinal, corticopontocerebellar, and corticobulbar tracts as well as other structures. 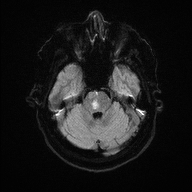 From the basilar artery which lies anteriorly and provides median and paramedian perforators. 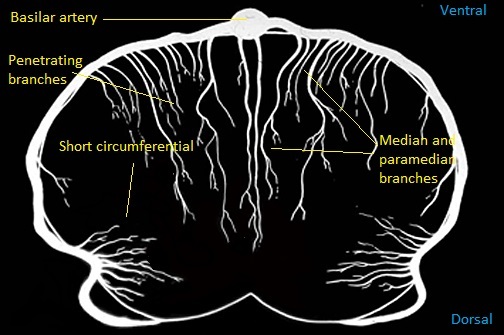 Middle cerebral peduncle is supplied by branches of the superior cerebellar and anterior inferior cerebellar arteries. LMN or UMN VIIth which is ipsilateral. Pontine strokes are usually unilateral and reflect small vessel occlusion of penetrating vessels. 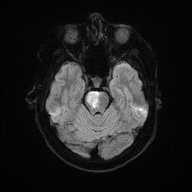 Occasionally a basilar artery occlusion blocking the ostia can result in bilateral infarction as can be seen below. Small vessel strokes share same risk factors as small vessel disease elsewhere with hypertension, diabetes and age as significant risk factors. 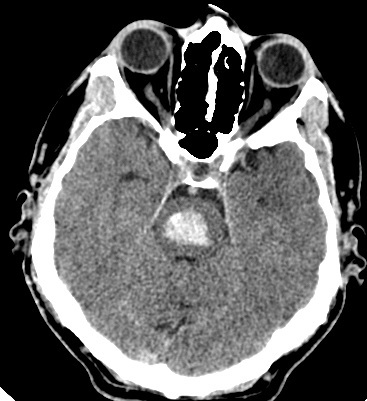 Large vessel basilar infarcts also share the same risk as other large vessel strokes including localised atherosclerosis and embolism. The fact that the fourth ventricle lies behind the pons means that any swelling here can result in obstructive hydrocephalus which may require shunting. Bleeding into the pons is associated with a high fatality up to 50%. Try to establish the cause which is often hypertension but may also be due to a AVM or Cavernoma which may do better. Clinically most patients will be comatose depending on the extent of brainstem damage and there may be Pontine and other brainstem signs with diplopia, nystagmus, nausea, vomiting. 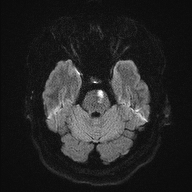 The main investigation is non-contrast CT initially which should be sensitive enough to pick up posterior fossa blood and then follow up with MRI/MRA. Management is traditionally conservative. Outcome is hard to predict, some patients do very well and others less so. In a younger patient it may be reasonable to intubate and ventilate and see what happens. The fact that the fourth ventricle lies behind the pons means that any swelling here or bleeding into the ventricle can result in obstructive hydrocephalus which may require shunting.